Posted August 20th, 2018 by OS Eyecare & filed under Contact Lenses. A contact lens recovered from treated sewage. The American Chemical Society has recently published research regarding microplastic contamination in our waterways and how improper contact lens disposal is contributing to such contamination. Approximately 45 million Americans wear contact lenses, and according to research, about 20% may be flushing their contact lens down the toilet or washing them down the sink rather than disposing of them in the trash. Lenses in the waterways do not biodegrade easily at the wastewater treatment facility and can defragment and make their way into surface water. This creates microplastic pollution that is harmful to the environment. According to a study in 2015, there is a total of 93,000 to 236,000 metric tons of plastic in our oceans. 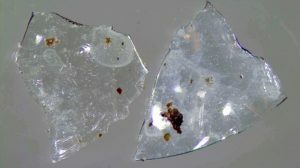 Obviously contact lenses aren’t the largest contributor to the problem, but they are contributing to microplastic contamination. It is thought about 22,000 metric tons of contact lenses are flushed each year, a result of potentially billions of lenses improperly disposed of. We educate our patients every day when it comes to contact lens cleaning, wear schedules, and frequency of replacement, but how to dispose of them has not been a point of focus in the past. This research brings light to the fact that we should be educating our patients to properly dispose of their contacts in the trash. Contact lenses may seem like a small item to dispose of, but it’s one small thing we can all easily do to protect our environment. It’s no harder to toss it in the trash than in the water, but most people probably don’t realize they are doing harm by tossing them into water.